Our second week on Mull started with the sort of weather predicted for the first. Grim and wet. 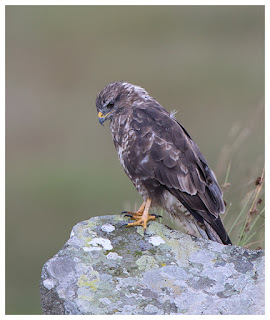 My early morning potter around the area yielded nowt but a few bedraggled-looking buzzards, and not close enough to bother photographing. We saw the family of white-tailed eagles as usual, though I don't think I could ever get used to seeing such huge birds on a daily basis, and round at Loch Na Keal, we spotted an otter dozing on the shore. Alas, the weather closed in while I waiting for it to do something, and during the subsequent deluge, the otter swam off! 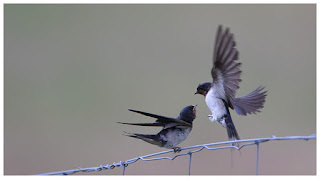 The day ended with a pretty high tide, swamping the area I normally watch the small waders on, and in the gloom, I found interest with the swallows buzzing around, in particular the fledglings being fed by their attentive and energetic parents. Not quite the same light as I enjoyed a similar scene over in Lincolnshire some time back, but something at least from the day. Another wet morning followed, though I had more luck, and spent some time with a young buzzard that sat on a rock, oblivious of me nearby. The sight of a male hen harrier brightened the gloom. Never really close, but I had good enough views to see the plumage on him, and guessed he might be a young male, starting to get those ghostly colours of an adult at last, but with traces of his juvenile colours still showing on his back. A couple of cars parked up alerted us to something, and peering over the rocks beside the loch we saw what was being looked at. One of the adult white-tailed eagles had delivered a food parcel to the juvenile. She was sat on the shore tearing into whatever was handed over, while the adult sat close by, on a small island. 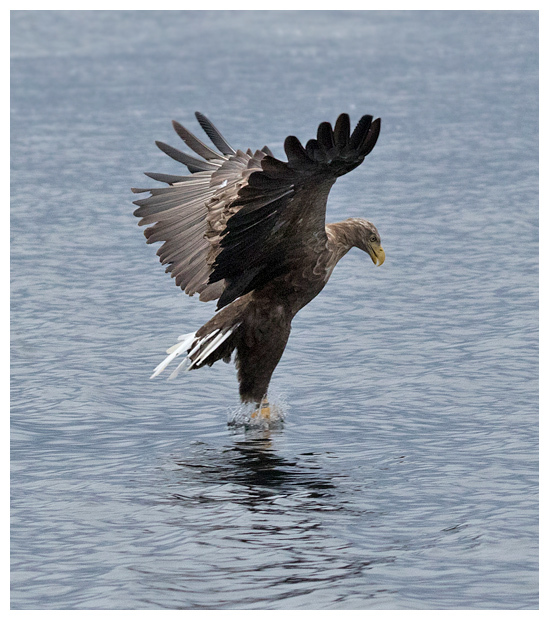 After a while she flew further along the loch, and the adult followed shortly after. Thankfully the weather improved and by late afternoon, the sun was out, allowing us to watch the high tide on the marshes. The rising water must have forced the numerous rodents in the marsh to swim to dry land, and this made things easy for the local birds. We watched as the hen harriers, crows and even the gulls picked off the unfortunate creatures. Also caught out by the tide were a group of sheep, and they eventually had to make a swim for it. Most were capable, but we were concerned for a small lamb at the back as it struggled against the currents. Thankfully it scrambled to shore and they all trudged past where we were parked, looking well, sheepish! 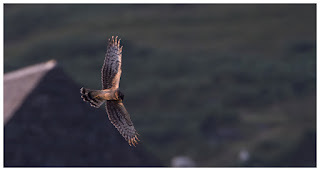 As dusk fell, the harriers strayed closer. 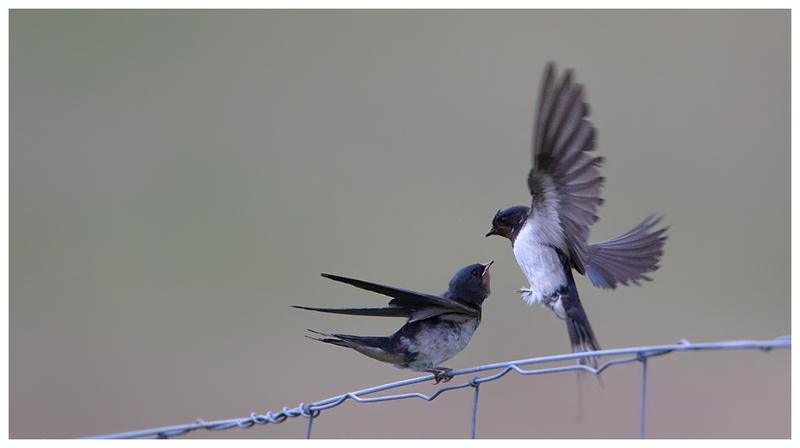 But with the clouds of midges in the still conditions, I couldn't sit with the car windows open. I managed some shots as one ringtail flew past, but it managed to do so at a level below a line of grass! 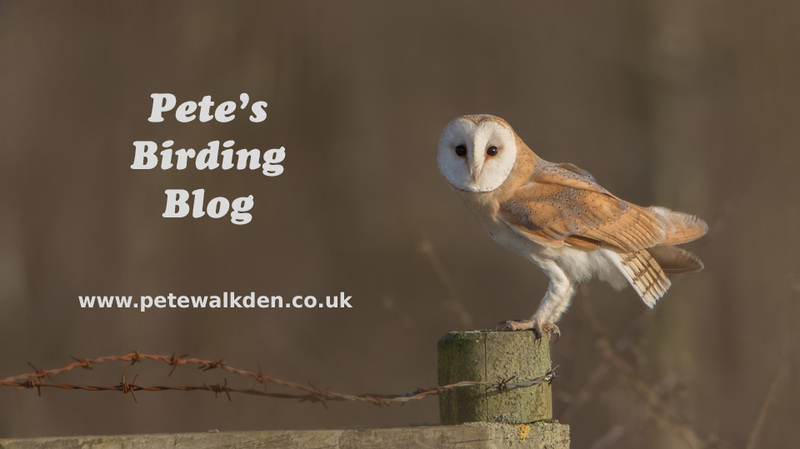 My morning drive initially began with disappointment, when I noticed a hen harrier sat on a fence post right next to the road, but it flew off before I could get close. On climbing over the rocks to see where it'd gone, I put it up again from a hidden perch, and it vanished off into the hills. Then as I drove along the back of the loch, I thought I had seen a shag sat beside the loch, facing away from me. But something didn't look quite right, and as I got closer, the bird turned its head. 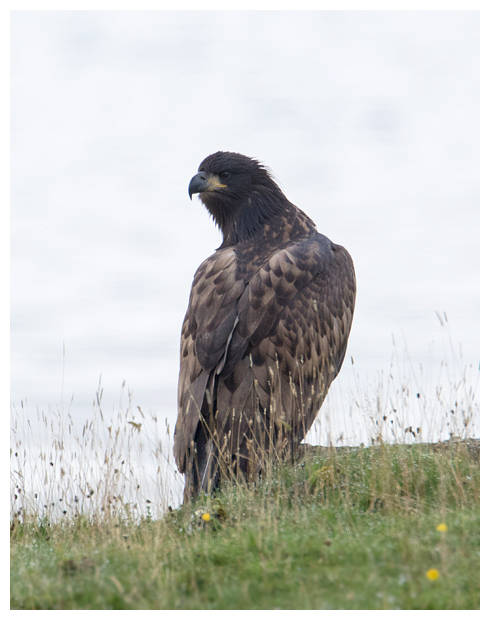 Not a shag... but the juvenile white-tailed eagle, and with enough momentum, I could turn off the ignition and rolled the car to a stand-still alongside. She didn't fly off, seemingly more interested in what the retreating tide might leave behind. Holding the camera and lens across the passenger seat is tricky most times, due to the weight, but when excitement takes hold and the trembles begin, then it's even harder. What a view! Just sat there, looking this way and that. After a good five minutes, she took off, and I assumed she'd fly back to the nest area. She didn't. She landed again, only this time even closer to the road! I started the car and slowly approached, again turning the engine off to be as quiet as possible. I couldn't believe she was that close. Through my camera, I could barely fit her in the frame, so had to take the converter off for more space for a shot. It's not every day that you have such a view from the side of the car, so I tried to absorb it as much as possible. 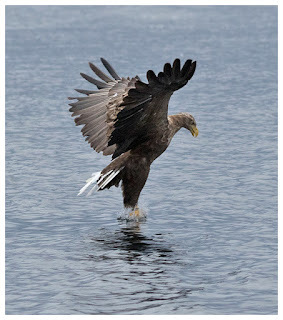 Failing to see anything again, she then flew along the loch and landed behind some trees beside the shore. I walked down and peered through the branches. There was no clear shot available, so I just stood and watched her for a few minutes. When you're that close, you really get a feel for how massive they are, even at such a young age. My final views of her were when she relocated to a paddock, and I grabbed a few images with a better backdrop. The sound of a tractor approaching put her up, and she drifted out of sight over the hills. Wow. What a morning. The remainder of the day was spent up in the hills towards Carsaig, where we watched both species of eagles, hen harriers and what I thought was a massive hoverfly on my car. Turned out to be a giant horsefly, so I'm glad that didn't decide to bite me! Would have needed A&E treatment. After the excitement of seeing the eagle so close up, I had high hopes for the second week, but things went strangely quiet. I barely got a shot on one day, with some greenshank that I was about to photo being scared off by a farmer. 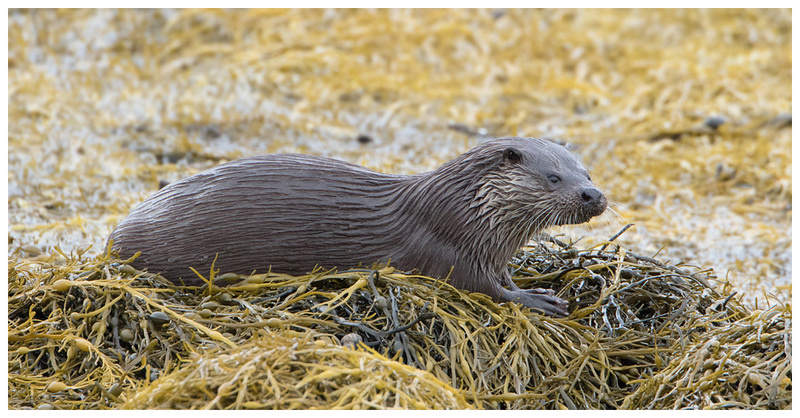 I managed to get some otter shots the following day, but with it being very wet that day, Dad didn't accompany me so missed out. The penultimate day was again lacking in opportunities. In the morning sunshine, I watched a peregrine pluck an unfortunate dove, but was a bit far off for anything more. Made me sad though, thinking of the family that I had been following locally, that were poisoned. 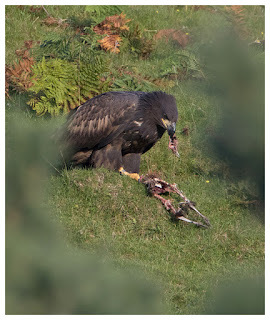 At least the falcons up in Mull don't have to contend with such brain-dead imbeciles as those in England. But with nothing much else to photo in the day, I tried testing the high ISO capabilities of the 7Dmk2, and as expected, at 10,000 the images were... terrible! Oh well. One last day on the island, what might be in store? Well first off, we had our second trip on Mull Charters, and despite the low cloud and occasional spell of drizzle, the eagles were on fantastic form, coming out five times to us. And it was remarkably calm too. 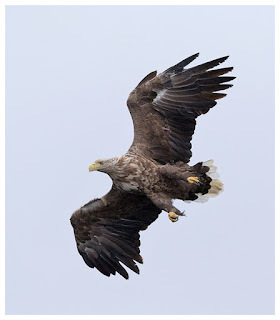 The boat may as well have been in dry-dock, as there was barely a ripple, and this made things far easier to track the eagles as they descended. I've said it before, but each trip with Martin seems to yield something new, and makes the boat trip hard to overlook when I'm on Mull. As we climbed back on to the harbour wall, bid farewell to Martin and Alex, I had a look at the skies and suggested to Dad that we try for the golden eagles. Parking up, we kept an eye on the hills and hoped. It kept raining on and off, so the bags of sweets in the car took a hammering while we waited. Then over the hill tops I made out a shape. Too big for one of the buzzards around there, and following behind was another. Goldies! 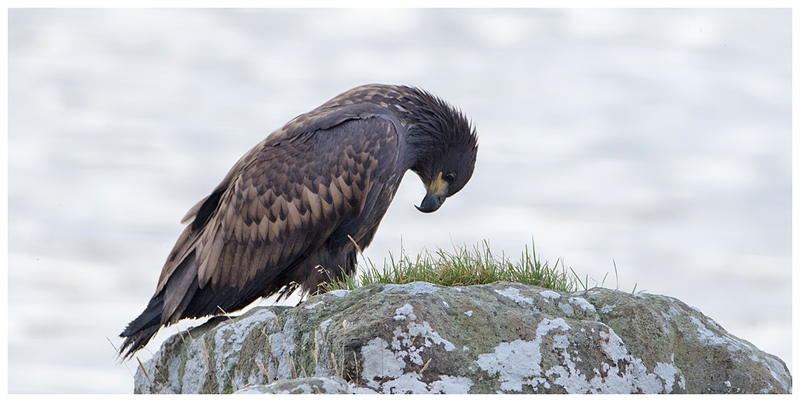 Scanning the grassy slopes of the hills, the eagles were obviously out hunting, and after we relocated to a closer position, we got glorious views as the pair used the on-shore breeze to hang in the air, taking their time to study the ground below for movement. Of course this gave us time to grab masses of images. After they drifted away and over the hills, I turned to Dad and couldn't help but grin. What amazing views! I was tempted to leave, but something inside told me to hang on... 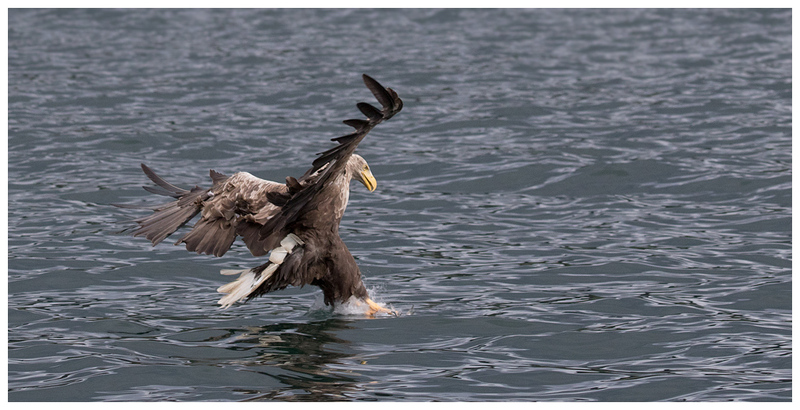 Turning round, the eagles appeared again, only this time even closer. Not quite frame-fillers, but close enough for me to get that buzz of excitement again. They even appeared to study us for a few seconds, before continuing on their way. 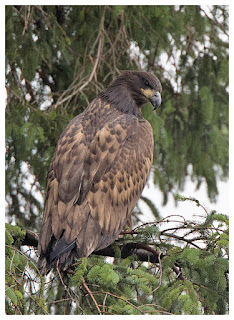 The sun started to break through the low clouds, revealing some blue sky, which tempted the pair of eagles to soar upwards and in a few moments they were lost from view. My grin was making my face hurt. Heading back for a meal at the pub for the last time, I glanced across Dad into the field beyond. It appeared to be a sparrowhawk at first glance, then I saw the white rump. 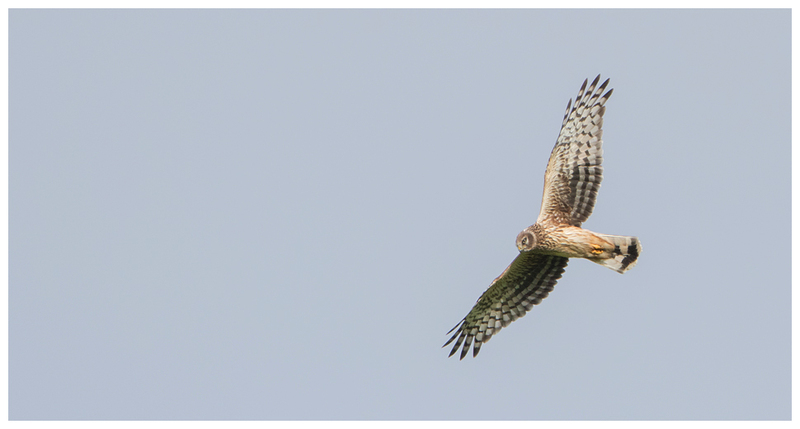 Hen harrier! Thankfully, there was no other car on the road, and I could brake and jump out for some pics. With the sun now shining, the ringtail looked stunning as it quartered the field. What an incredible day. White-tailed and golden eagles, and now a hen harrier. 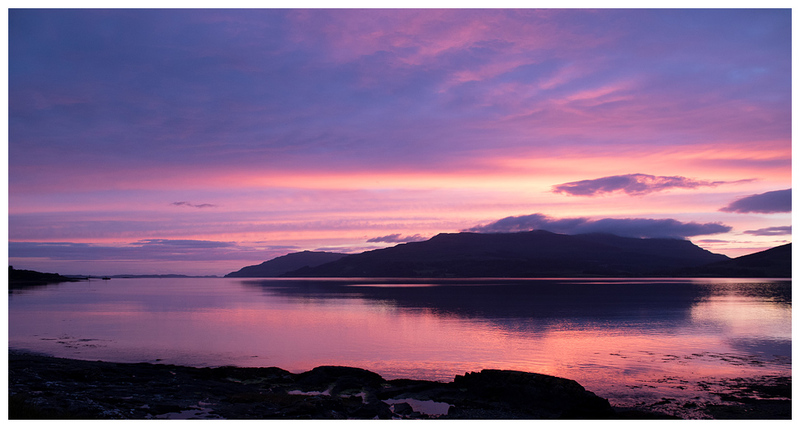 Mull sure has a way of making amends for a quiet spell! The meal in the Craignure Inn tasted extra special that evening, but the next morning it was time to leave. Sat in the car in the queue to the ferry was a strange affair. I never want to leave the island, and the fact that my friends Steve and Tracy were on the arriving ferry made it worse. Steve managed to briefly greet us as he arrived, and tried to persuade us to stay for another week, but we had to be back unfortunately. As usual, Mull had delivered the goods, and made me yearn to return as soon as possible. I think everyone who follows this blog and me on social media knows my affection for the Isle Of Mull, and having spent a week there in March, I was keen to return at a more familiar time of year. Prior to the trip, as usual I had checked the weather forecast and been disappointed to see a rain symbol for every single day of the trip. It's an island, I thought, things change. The drive up was pleasant enough and it was a relief to find that the road around Loch Lomond has finally been completed, which had often been a hold up on previous trips. As usual, after dropping the luggage into the B&B, we strolled around Oban for a short while before settling into the quayside pub, indulging in some of the ales on tap and scoffing down a meal. The weather seemed pretty changeable, and we watched the harbour briefly disappear behind a wall of rain. After filling our stomachs with breakfast, the car with diesel and its boot with shopping, and we were soon sat on the ferry heading over to Mull. First birds seen included black guillemots, terns, gulls and gannets. And it wasn't raining either. Having sat rather impatiently waiting for someone who thought it'd be ok to be the last to return to his car despite being almost at the front of the ferry, I was soon lapping up the views along the road between Craignure and Salen. Dad adores this stretch of road, as the views are fabulous and it seems to have a micro-climate whereby we virtually always see it in sunshine. As is tradition, we parked up at Kellan where we soon spotted the first white-tailed eagle of the trip. Soaring around the back of the trees, it was a brief view, but never a bad thing to see. 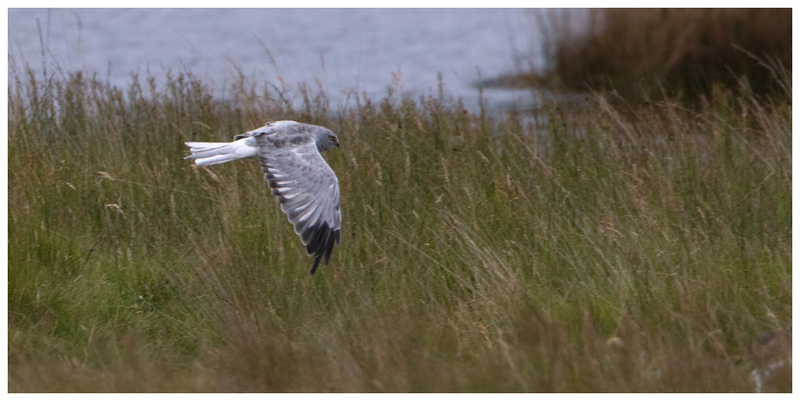 As were the hen harriers I spotted on my tour of the marshes later that day. 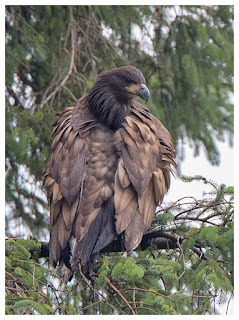 As in March, there seemed to be a number of them around, including males and at least one juvenile. Calling into another favoured area for white-tailed eagles, I managed to find the family group sat in the tall pine trees, though the constant calling of the juvenile was a bit of a giveaway! 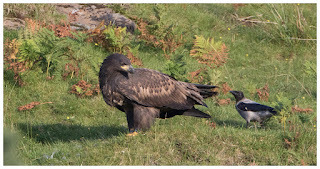 Eventually one of the adults dropped something over to the juvenile, and flew off, leaving the other adult to feed whatever it was, possibly a mountain hare, to the noisy youngster. The first day ended, after I'd enjoyed watching a number of hen harriers return to roost, with a vibrant sunset. Welcome to Mull, I thought. It soon became clear that the forecasts were wrong, and in a reverse to normal weather maps, the north and west of Scotland was jutting out into clear skies, leaving the rest of the UK under the rain and miserable weather that had been predicted. 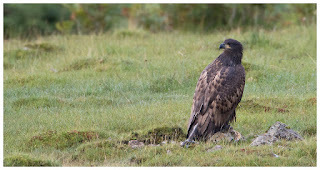 Our first full day didn't yield a great deal in terms of photos, though I did get some buzzard and hen harrier shots on my dawn drive. We simply enjoyed soaking up the views and ambience. It was even warm enough to sit outside the pub in Craignure for a meal. Bliss! Remaining slightly too far away for good shots, I still sat out on the marshes until dusk hoping one of the hen harriers might come a bit closer for a shot. And while I sat smiling watching these skillful masters of the skies floating across the marshes, a part of me felt sad and angry that I have to travel so far to see this spectacle. It should be a sight in England, and would be if it weren't for a small minority of well, I can't post what I'd like to call them on here. 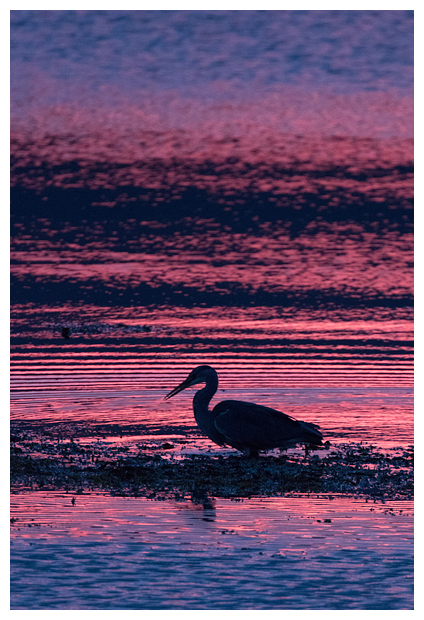 An early start for both of us on the Monday as we were booked on to Mull Charters' trip to see the white-tailed eagles, and setting off early gave us time to amble around the scenic route, and grab shots of anything along the way. It's always good to see Martin and the Lady Jayne, and Alex was helping out on board too. Round to Loch Na Keal and we were treated to a couple of visits from the stars. 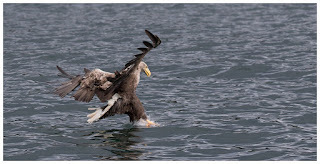 As the mk1 was before, the Canon 7D mk2 coped admirably with tracking the eagles as they approached, swooped and grabbed the fish. And while I still wouldn't mind one of the new 100-400mm lenses, I do really like the old push-pull mech of the original, as it is so easy to adjust as the bird starts to fill the frame. 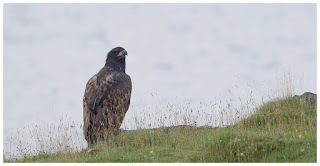 After a tour of the seal colonies, coffee and biscuits and banter with Martin and Alex, we were back on dry land and chasing golden eagles in the northwest area of the Isle. While never close, we managed to see four individuals. 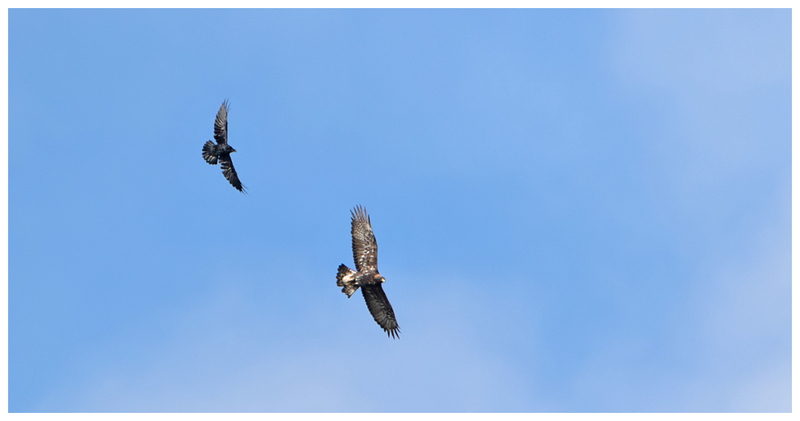 Plus the same number of buzzards all together in one spot, chasing one of them that appeared to be carrying a snake around. And for the third night running, we had a gorgeous sunset. 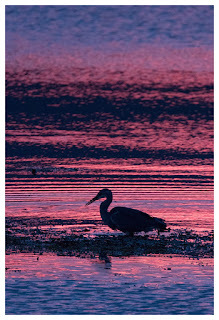 Only this time, rather than only taking scenic images of the loch and hillsides, I located one of the many grey herons dotted around the area, and with the changing colours of the sunset reflected in the ripples and shallows behind, proceeded to capture some silhouettes as the heron fed. Yet another sunny day tempted us to visit Fidden and it was glorious down there. Barely a breath of wind, the turquiose waters and golden sand were almost tempting enough to dig out a deckchair and sit on the beach. I didn't, but watched the antics of rock and meadow pipits feeding amongst the rocks and seaweed, plus a family group of rooks poking around on the grassy areas behind. And a wheatear posed quite nicely, though it kept being spooked by the many sheep feeding nearby. My evening trip stole the show that day though. With nothing much on the marshes, I'd parked up on the north shore and was watching the many pied wagtails scuttle around. 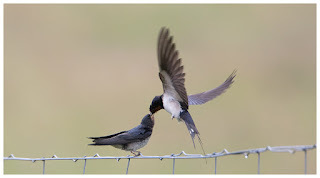 Still lots of swallows, house and sand martins whizzing overhead too. Then something much larger sailed over and I watched one of the adult white-tailed eagles deposit something to the juvenile that I'd manage to miss seeing on the hillside nearby. When the adult returned to the trees, I could see that the juvenile was now busy tearing at something, attracting numbers of hooded crows, no doubt hoping for some scraps. Relocating to a closer view point, I was actually trembling with excitement as I photographed the four month old juvenile white-tailed eagle as it tore lumps of fur, bone and flesh from the poor mountain hare, presumably caught by one of the parent birds. My view wasn't completely clean as there were gorse bushes on the hillside, but perhaps they worked in my favour as the eagle couldn't see me too well. Not that it was bothered, as it continued to make light work of the prey. 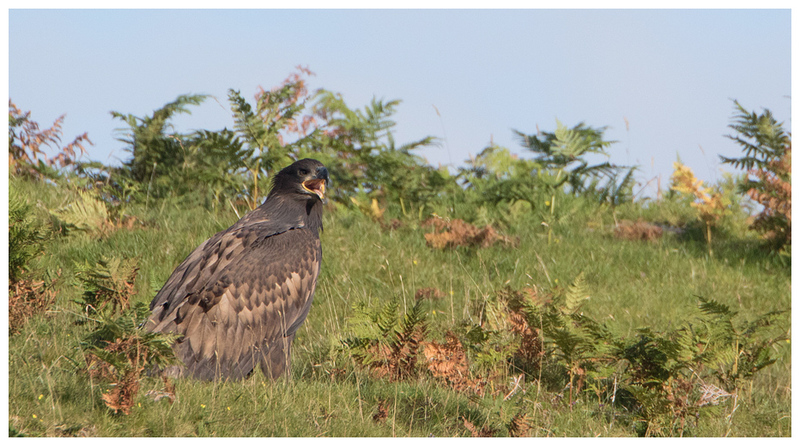 Apparently a hare isn't enough for a growing eagle, as it (a female, I later found out) then hopped down the slope and dragged out a carcass of a pheasant, which it then started to pick at. Not much meat left on these bones though. She gave up trying to find any more food on it eventually, and climbed the hillside to perhaps digest supper in the last light of the day. 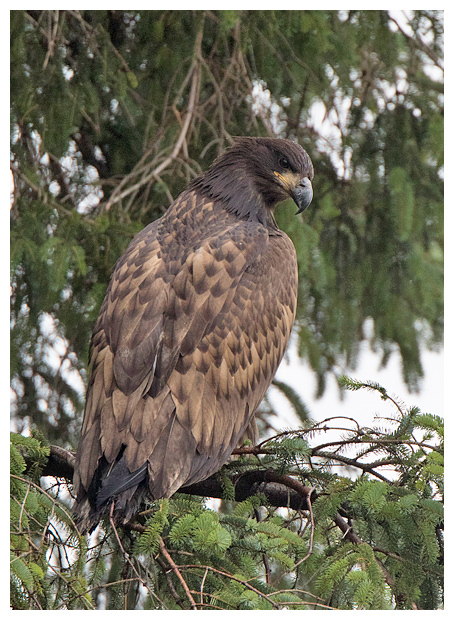 And before I could relocate to get some shots from a different angle, she was spooked by traffic on the road, opening those enormous wings and drifting effortlessly across the glen to the trees near her parents. 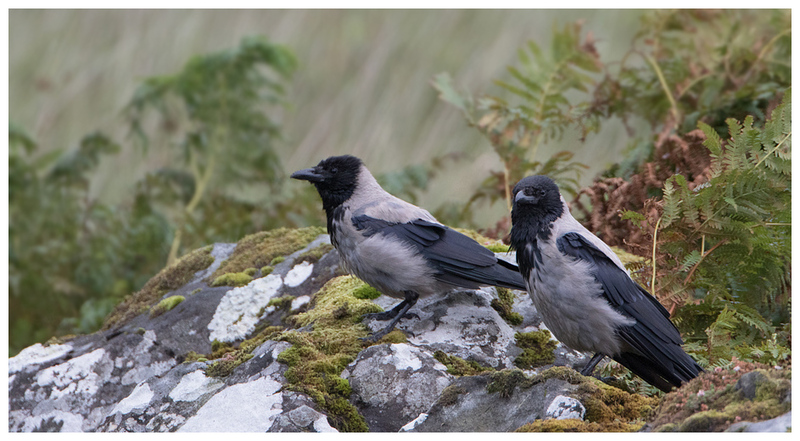 Wednesday morning's drive was wet and aside from some uncooperative ravens, I didn't get much to write home about. However, the skies soon cleared and we chose to stay on the south side of the island, and see what was around locally. And it was a day of mistakes by me that caused frustration. 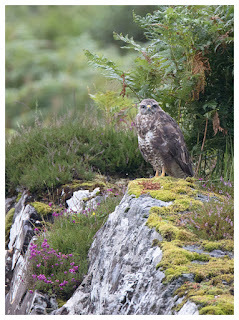 There are many buzzards around, and where we were sat, they were constantly gliding back and forth across the glen. So much so, I foolishly took them for granted and chose to ignore them as they went. Huge mistake. 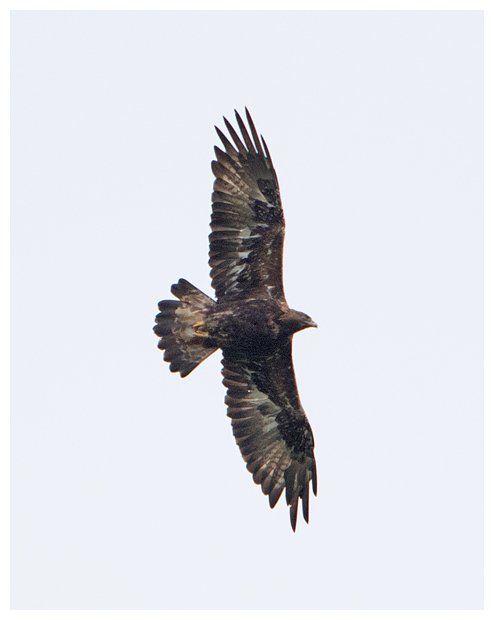 As two "buzzards" went overhead, I only gave them a cursory glance, only to then see them across the glen start to circle over the trees, gaining altitude. They looked pretty big for buzzards. They weren't. 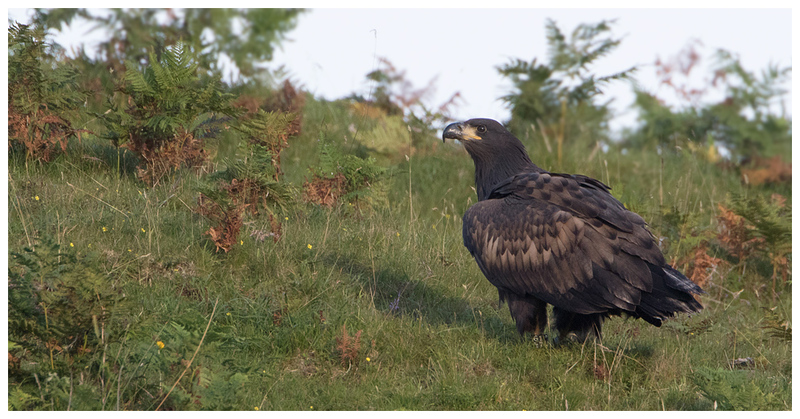 A pair of golden eagles had just gone over and I'd missed them. What a prat I thought. By the time I caught up, they were soaring high up. Then to compound my mistake, I repeated the ID error. 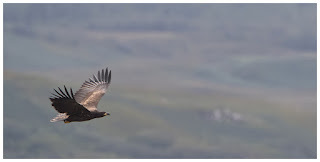 Sat in the top of the valley, we were laughing about the horrid sound that ravens make, and seconds later, the ravens appeared, chasing two "buzzards" down the hillsides. Initially I chose to watch but then alarm bells went off as I realised these buzzards were over twice the size of the ravens. Double dose of being a prat. 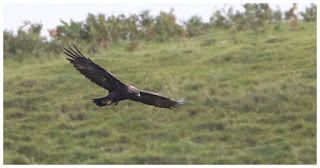 The same eagles I'd missed before, and again were too far away in seconds for decent shots. Argh! Awesome to see but I so wish I'd had the camera ready. 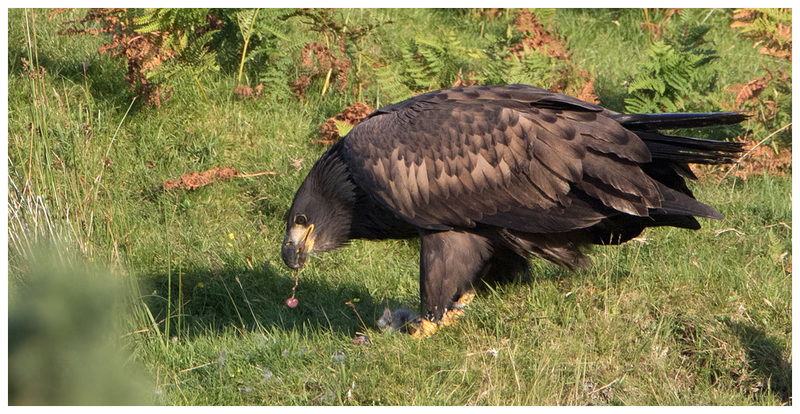 Thankfully the day had a treat in store for us both when the juvenile white-tailed eagle returned to the pheasant carcass, to pick yet more bits from it, only this time Dad was with me, to enjoy the view. 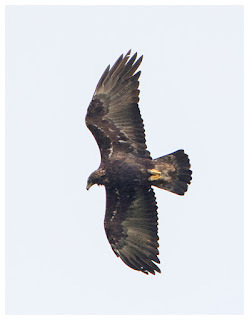 Cue more pics of this impressive young bird. 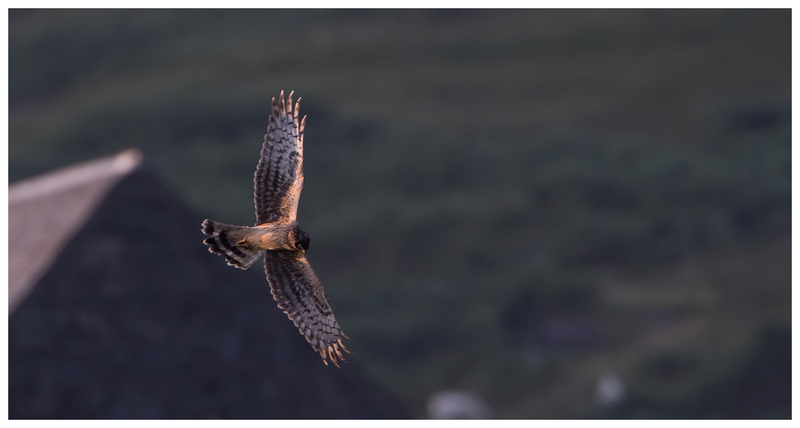 More great views of the harriers at dusk, with one of the males coming pretty close for once, though it was so gloomy by then, even the new ISO capabilities of the 7D2 struggled to yield a workable result. The wet weather promised before the trip seemed to be making its way on to the island, and Thursday's dawn trip almost didn't happen. I peered through the curtains and saw the rain lashing down; it was very tempting to stay in bed. I didn't, and as is sometimes the case on grim days, it was a wise move. 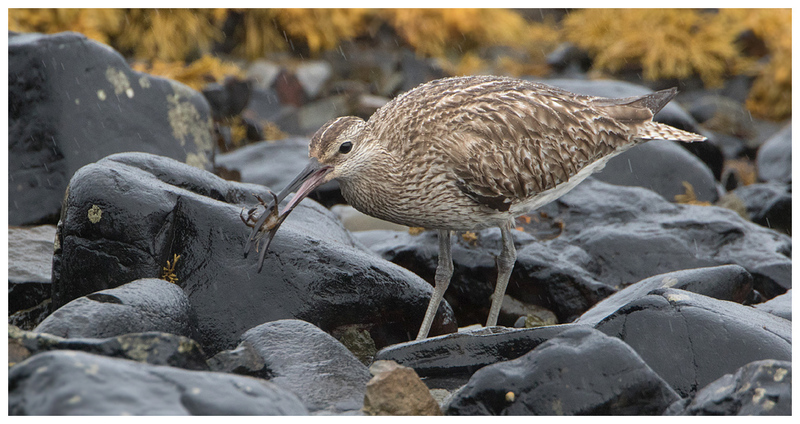 Along the shore from the digs was a lone whimbrel, initially snoozing on the seaweed. After waking, it then pottered around the small boulders, and soon plucked out some crabs trying to hide in the shadows. It didn't both breaking them into bits, and simply wolfed them down in one go, resulting in a rather comical lump briefly appearing on its neck. On the north shore of the loch, movement in the seaweed caught my attention. An otter. About time I caught up with one. Initially I tried to predict where it might come ashore, had some success but it doubled back, and swam past my hiding place, and further down the loch. I followed, and after settling into a hollow in the rocks, I was glad of my Paramo jacket, as the rain started to pour down once more. 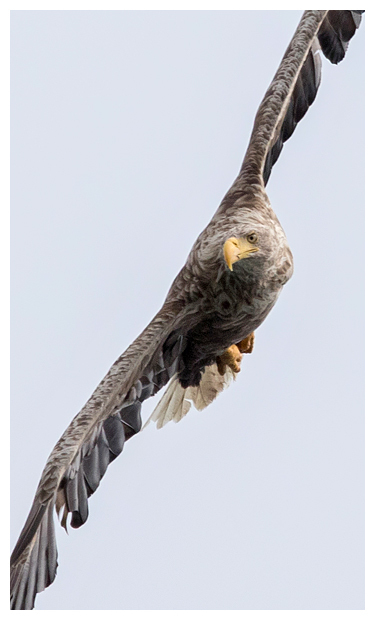 The otter appeared nearby, and for a moment, as I glanced upwards to see one of the local white-tailed eagles going over carrying prey, I considered following that. I didn't, and sat to see what might happen here. So glad I did, as seconds later, another otter appeared. Initially they vanished behind one of the larger rocks beside the shore and I could every so often see them splashing around. I needed to move, but didn't want to spook them, so waited for them to climb out and dry off. With their backs to me, and with the sound of the driving rain all around, I was able to creep closer, and again find a hiding place to observe from. I could then watch them as they slid back into the loch, and seemed to play with each other, tumbling, grabbing and climbing on one another. There didn't appear to be any malice, and every so often, they'd scramble back out to dry off, and roll in the seaweed. It was fantastic to watch and even the dreadful weather couldn't wash the smile from my face. Eventually one of the otters headed off, away from the other and I watched it vanish up one of the streams that feed the loch. The other then clambered into the spot abandoned by the other, and rolled around in there too. Parking in my preferred place, I scanned the area and failed to see any. On the shore area, where the tide had retreated I noticed a couple heading down to the water, and based on that I thought my luck was out and was about to leave when I saw the juvenile white-tailed eagle lift off from the ground near the couple, and fly upwards. Grabbing my camera, I had taken my eyes from it for a couple of seconds, thinking it was going to be flying close to me, but when I looked back, it'd gone. Bizarre! Or had it? Scanning the trees close to the shore I made out the rather enormous shape of it, sat quite low down in the branches of a tree beside the road. And when a car went underneath, she didn't budge. I had to chance it. Driving round and past, I parked up outside the cottages, and opened the door slowly, craning my neck to peer out and upwards. She was sat there, looking out at the loch. Initially I took some pics from inside the car, and with a torrential downpour, had to sit and wait. I hoped the weather wouldn't rob me of this opportunity. It didn't, and she was still sat on the branch after the rain passed, and I tried to get out. She didn't bat an eyelid, so I grabbed my monopod and started to get some better angled shots. After a few mins, I noticed Bryan approaching with his wildlife tour and beckoned them over. As with the other traffic that had passed when I was stood there, including a deafening tractor and trailor, the eagle sat still, and his group were able to enjoy the same breathtaking view of the bird as me. Eventually they left, and I decided to also leave with the eagle in place. I hoped I could collect Dad, and get back with her in situ, but on our return, she'd relocated to one of the other trees, much further back. The remainder of the day was more for seeing distant things, such as golden eagles and later ended with more views of harriers, though as normal a bit far off and too dark! Friday already, and we chose to try the road to Lochbuie and Croggan as I've seen plenty there in the past and the area by the huge yew tree and graveyard is often a sheltered but stunning location to simply admire the view. Whilst scanning the shore along that route, I spotted a rock that was moving. Now normally rocks don't do this, so I took a closer look and confirmed my suspicion. An otter, and this time Dad was with me to enjoy the view. The otter had been eating something and stayed on the shore for a few moments to clean up, before slipping out of sight under the seaweed. As the weather improved, the wildlife seemed to become harder to find, and we found our way to the Craignure Inn for a bite to eat before returning south, and on my evening tour, the only bird of note photographed was a sparrowhawk, which was sat on a fence drying out after diving into the vegetation unsuccessfully moments before. Amusingly, as is often the case with the presence of such a bird, all other smaller birds fell silent, apart from one mipit, which decided to fly past the hawk, calling out. 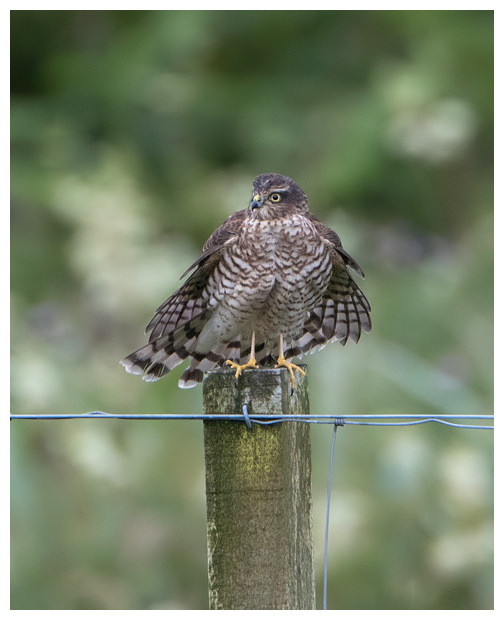 The sprawk seemed as surprised as I was, and after a second glance, took flight to chase the daft creature. Fortune fell on the side of the pipit when it managed to dive out of harm's way to escape. 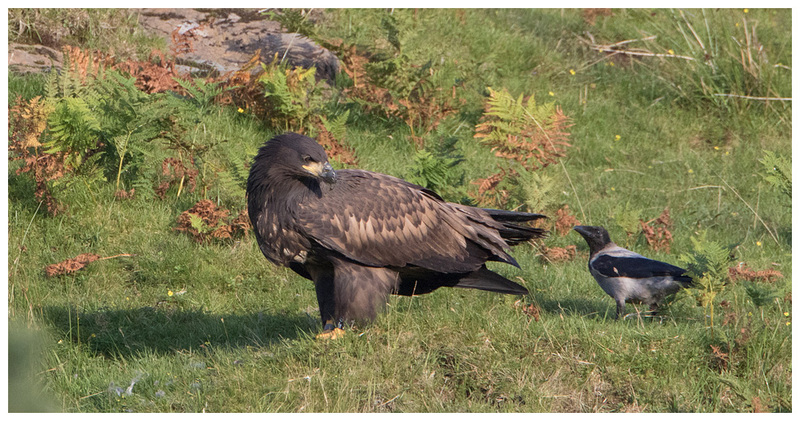 The end of a packed week of wildlife on Mull and only halfway through the trip. More of the same, I hoped for the second week.